The record is for continuously standing motionless. You must stand: sitting is not allowed. No facial movements are allowed other then the involuntary blinking of the eye. Deep breathing is permitted provided it does not involve observable movement notably greater than that in normal breathing. No rest breaks are allowed at any point during the event. The venue for such an event should be such that the general public can view. Notes: A claim of 22 hrs by Hatoino Delirio (Portugal) in 1997 was not officially confirmed. Akshinthala Seshu Babu stood motionless in Mahatma Gandhi's posture with a stick for 25:01 hrs in 2001 and for 35 hours in 2002. The record in 2003 was achieved without a stick. On 26/27 January 2015, Babu made one more record attempt which lasted 37 hours. Unfortunately, it had to be interrupted because of an insect bite. 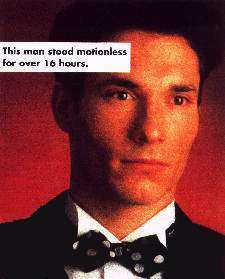 However, he still stood still for 35:22 hours in total. Martin Bukovsek set a record for walking slowly on 21/22 June 2013 when he walked 2 metres in 27 hours in Königsfeld, Germany.